Established in 1951, Castrolanda – Agricultural Cooperative Ltd. is an agribusiness cooperative composed of 900 farm members and 3000 collaborators. 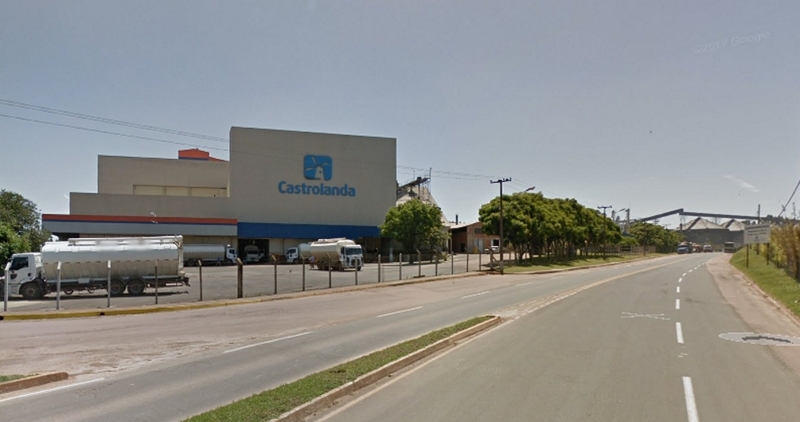 Headquartered in Castro (PR), its other corporate offices are located in the states of Paraná, São Paulo, and Rio de Janeiro. 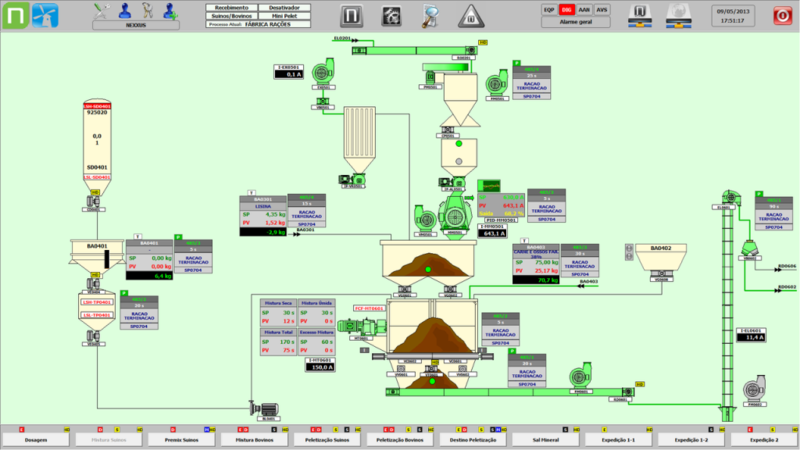 To monitor processes and to remotely control the animal feed factory machinery in in its headquarters, Castrolanda has decided to adopt the software Elipse E3, in an application developed by Nexxus Evolution Systems in 2014. Developed by Elipse Software, the Elipse E3 solution was chosen due to its client-server distributed architecture, great cost/benefit ratio, and development structure, which are ideal features when implementing dosage systems. Elipse E3 allows monitoring all processes taking place at any point in the production chain. The first stage is receiving the raw materials that are used for producing the animal feed. At that point, operators can monitor, via number codes, which products were delivered to the silos by trucks, as well as the total weight stored in them (the darker shade of yellow in the figure below stands for filling degree). Usage priority is also illustrated by the software at this stage: number 1 stands for higher priority. Once received, these products are available for dosage according to pre-configured formulas and then go through a second stage, where they are sent to mills and mixers. At this stage, Elipse E3 monitors the products passing through the pre-mixer, the mill lung, the mill, the mixer’s superior lung, the mixer, and the mixer’s inferior lung. After passing through the mixer, the final product (feed) goes through a third stage in the pellet mills before arriving at the expedition silos. 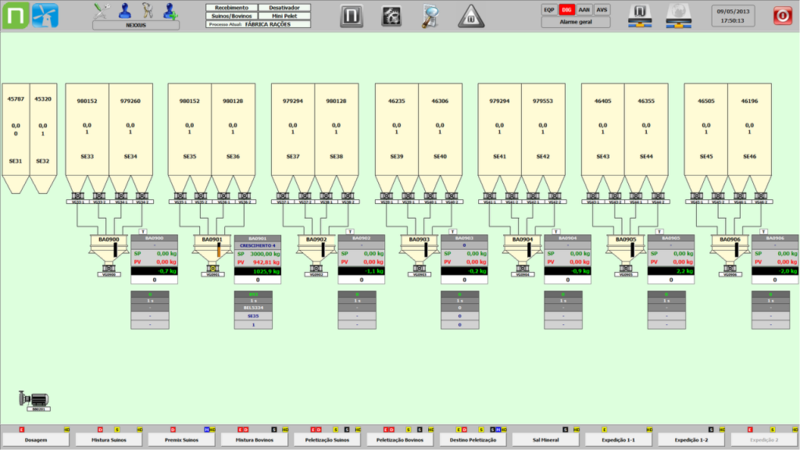 On the left side of the screen, the software displays the oil and fat dosages before they are sent to the mixer, where they are mixed to the solids. At this stage, Elipse E3 presents the mixtures in real and stipulated time. The electric current of the mills responsible for grinding the solids into grains is also displayed. 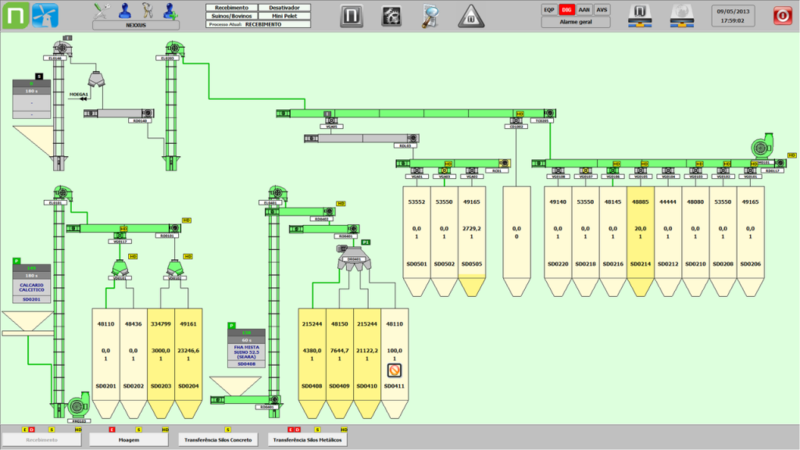 Once these ingredients have been thoroughly mixed, operators are able to monitor the dispatch of the finished material (feed). At this stage, the software indicates which products and silos are being used, the silo’s usage priorities, the boxes with feed being sent via trucks, and how heavy each box is (in kilograms), both altogether and in real time. Operators are also able to visualize stock keeping units, order numbers, and the license plate of the trucks transporting the animal feed to the market. Finally, the software allows controlling lifts, redlers, forks, and the exhaust system at the factory, as well as recording events via reports and charts that act as tools for audit analyses. With it, operators can record stops, check for crossed contamination, monitor users and production quality, track raw materials, and schedule production. Integration to the corporate system.